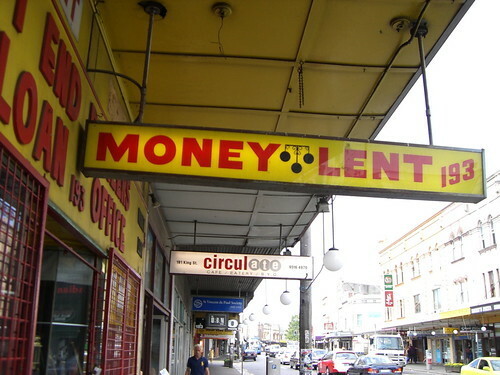 Should Christians Lend Money and Charge Interest? You are here: Home / Bible and Money / Should Christians Lend Money and Charge Interest? Why was there such a negative view of moneylending and moneylenders? Economically, from the beginning of Western thought, usury was regarded as unproductive—as the taking of something for nothing. Ethically, the practice was condemned as immoral—as unjust, exploitative, against biblical law, selfish. Yaron Brook. The most hated sort [of moneymaking], and with the greatest reason, is usury, which makes a gain out of money itself, and not from the natural use of it. For money was intended to be used in exchange, but not to increase at interest. And this term Usury which means the birth of money from money, is applied to the breeding of money, because the offspring resembles the parent. Wherefore of all modes of making money this is the most unnatural. Quoted by Yaron Brook. Moneylenders are still blamed for recessions; they are still accused of being greedy and of taking advantage of the poor; they are still portrayed on TV and in movies as slick, murderous villains; and they are still distrusted by almost everyone. (According to a recent poll, only 16 percent of Americans have substantial confidence in the American financial industry. )70 Thus, it should come as no surprise that the financial sector is the most regulated, most controlled industry in America today. Yaron Brook. So where did all this negative ‘interest’ talk come from? During this time loans were offered by individual to individuals. Today most lending is done by institutions to individuals. During this time the wealthy lent and the poor borrowed. Today almost anyone borrows, even the wealthy. During this time borrowing was often an act of survival. Today borrowing is an act of convenience. (I bet some of you aren’t going to like that I said that). During this time within the context of ones own people (Israelite to Israelite) lending was seen as a compassionate and charitable action. Today lending is often a commercial action. During this time currency was typically non-inflationary. Today currency is inflationary. What is usury? Usury would be synonymous with our word interest. Interest, not necessarily unreasonable exaction, but all income from loans. Swanson, J., & Nave, O. (1994). New Nave’s. Oak Harbor: Logos Research Systems. Usury — the sum paid for the use of money, hence interest; not, as in the modern sense, exorbitant interest. The Jews were forbidden to exact usury (Lev. 25:36, 37), only, however, in their dealings with each other (Deut. 23:19, 20). The violation of this law was viewed as a great crime (Ps. 15:5; Prov. 28:8; Jer. 15:10). After the Return, and later, this law was much neglected (Neh. 5:7, 10). Easton, M. (1996, c1897). Easton’s Bible dictionary. Oak Harbor, WA: Logos Research Systems, Inc. When determining how scriptures apply to us, it is important to first determine what principals are introduced. A key biblical concern for the development of the community (Israel) not just increasing individual wealth. One could not lend within the community with an interest rate attached. However, outside of the community one could charge interest. Thus, one could lend to a foreigner, but not a fellow Israelite. The wealthy should not use their wealth as a way to leverage and increase the divide between themselves and the poor. Someone else’s poverty or difficulty should not become an economic opportunity for us. As a compassionate action, the lender should consider the situation of the borrower as much as she considers her own situation. When it comes to collateral one cannot hold an item deemed necessary for survival. Lending practices should reflect the compassionate nature of God. Until usury is recognized as both economically productive and ethically praiseworthy—as both practical and moral—moneylenders will continue to be condemned as villains rather than heralded as the heroes they in fact are. Yaron Brook. Think not only of your own interest (Phil 2:4) – pun intended. Consider if the person will be blessed by the request. Remember that the lender has set the rate. For one reason or another, that person has decided you would bless them by offering them a loan. Therefore, they cannot feel mistreated. In fact, people often feel like they are getting a deal and you are being a great help. Remember that when you bank (any bank) they make money by lending it. By banking, you are indirectly a lender. Read the description. A person wanting to borrow shares a bunch of details on the who, how, what, when, and where of the loan. This will help you decide if you are offering a helping loan or a hurting loan. Be sure the interest rate is reasonable. A high interest rate means a person is more desperate and your lending is more likely to take advantage of them. Secondly, this desperate situation also means you are more likely to not have the money repaid. I believe that the current lending context is so vastly different than the biblical context. In fact, there are legitimate lending opportunities where you can be a blessing to a borrower. In my post on turning a hobby into a source of income I discuss the importance of identifying how your product is a service to others. Lending does offer an opportunity to serve others. However, the other dangerous element is that lending can also encourage poor financial behavior. By lending you could be enabling someone who is seriously struggling with debt. Conclusion: Selective lending with the ultimate goal of helping others while receiving a return on your investment does not violate the biblical principles regarding lending. You know, I would like to see at least one Christian PF blog speak out against charging interest. Until the Renaissance, Christians were as against it as Muslims. I thought it was a valid point because most Christians probably do not know about the rocky historical relationship between Christianity and interest. While I don’t necessarily intend to “speak out against charging interest” I will address the question – should Christians charge interest? That night, Tuesday, August 4th I decided to sit down and start this post. That was before I knew there was going to be a Tsunami of posting on the topic of People to People Lending. Wednesday 5th Matt Jabs at Debt Free Adventure posted Lending Club – My Review of Social Lending. Thursday, August 6th I came across Personal Loan Interest Rates From Lending Club by Silicon Valley Blogger. So what has caused all the ruckus regarding the flurry of Lending Club Posts? For a limited time (August 15th, 2009) anyone who signs up and invests (lends people money) will get $50 to lend. Typically this promotion is for $25. If you are interested in signing up for Lending Club I suggest you (1) read some the above mentioned posts that introduce the program to be sure you are aware of the possible risks and returns. (2) Go to www.lendingclub.com. When you are signing up enter the referral code CEF when registering so you can receive your $50 bonus. Interesting post Craig. Thanks for the in depth look at the topic including historical context of the prohibitions of charging interest, and how current conditions are different. My post was one of the ones referenced above – where I talk about investing with Lending Club – lending out my money with interest. I was very careful in selecting who I would loan money out to – and only chose loans where the people were bettering their debt situations, and where they were working hard at removing debt from their lives. I tried to stay away from loans where people obviously weren’t being responsible, or where unreasonable interest was being charged. I think it’s a fine line that we need to be careful with when lending money – and we need to be sure that we aren’t being predatory in our lending or harming people in any way. .-= Peter´s last blog ..Should I Do A Debt Consolidation Loan? Important Things To Consider Before You Do. =-. @Peter Thanks for you comment. I think the selection process is the most important element as we control our lending. I do not want to be responsible for predatory lending as the Bible does not have a lot of positive things to say about it. Craig, great post. I’ve wondered about this myself. I am a Christian, and do participate in lending because A: I’m not feeling financial secure enough to donate money outright and B: I feel like it helps people while providing me with a little financial security, and a little gain. Thus far, my six month experience with both Lending Club and Kiva is showing me that it is indeed helping people–one of my loans has already been repaid (two and a half years early!) I just try to make sure that I’m acting in the borrower’s best interest. Great points, and great research too! Thanks! .-= jessc098´s last blog ..Day 10: Fix it first =-. @jessco98 Thanks for you comment. My main goal in this post was to address this question biblically as I know others have also asked the question. Thanks for your ideas. Thanks for researching and writing on this topic. As with many issues, Christians cannot simply find a “proof text” to hang their hats on. God expects us to consider the principles behind the actions and actually use our brains. You did a great job of not only giving the biblical historical background, but the reasons for the biblical directives. It was a help for me as I have been struggling with the issue. I plan to re-read this post a few times to let it soak in. .-= Joe Plemon´s last blog ..True Confessions: I Bounced a Check =-. Great post! I am a Christian and agree with your conclusions wholeheartedly. It’s an encouraging view of lending that I appreciate. .-= The Digerati Life´s last blog ..Secured Credit Cards To Boost Your Credit =-. @The Digerati Life Thanks so much for your comment. I’m honored to know you took the time to read this post and leave a comment. If a brother in-law borrows money, do you charge interest? You might, but because there’s a relationship the important thing is helping the person, the thought of personal gain vis interest runs counter to the generous impulse. Now, in P2P lending we’re speaking of people you have no background of relatedness to. I’m not a Christian personally, but I was raised to be one and I believe it is not Christian to accept interest because you are to love all as you love your brother. That said, the secular reality of lending always accompanying interest means that it is never ever wrong and perfectly legal to charge modest interest on any loan. But if you are Christian charging interest, understand Muslims hold the moral high ground. They never charge interest for loans, it is clear to them it is forbidden. I lived in Queens recently and many of the local shops were Muslim owned. Loving interest free loans are responsible for every one of those successful shops. And in that neighbourhood where were Christian run shops? There are Christians there, but conventional loaning practices demand interest and substantial collateral….. Thanks for you comment. It would be hard for me to lend money to a brother in-law. Ultimately, the question is what helps him more. Typically, people borrow from family because the bank won’t lend them money. I’m wondering if it would really be helping them by lending him money when the bank doesn’t even think he is fit to borrow. That said, in the past I have lent money to my immediate family. The interest was always better than what either of us could get from the bank. However, I doubt I would do that again. If I understand correctly Jews also still do not charge interest to each other. In the end the question is – is charging interest a matter of morality? In my case, I don’t think it is immoral to charge an appropriate level of interest. Hello Craig…I’m planning to enter P2P but i’m so confused because im so afraid that it might be immoral for me to enter that kind of business. I just want to ask, how much is the exact percentage I can give to the borrower of my money. This will help me a lot. I’m looking forward to hearing from you soon. Thank you so much. I still do not understand why you are justifying lending at interest. This is the reason that our country, America, separated from England. England did not approve of the colonies creating their own currency and using it amongst themselves with NO interest. England basically said “NO!” and told us that we had to now use their currency printed by their own Federal Reserve INSTANTLY throwing the colonies into debt. Was this fair? No. Do you see why this is immoral even on a non-Christian basis? The funny thing is that our country is now under the same powerful men that we fought off from England. You may justify lending at interest because you would like to pick and choose what applies in the Bible because of relation to the time that it was applied to, or that it simply applies universally because it does not associate it’s core concept with the concept of time. Either way, enabling the behaviour is in essence OKing it to be done on many different levels. Although you may not rip someone off, that is not security that another may, or even worse. If an action has the great potential to be misconstrued, warped, and even justified, it creates more future problems than anything. Do we really want to teach our kids that this behavior is OK? Thanks for your comment. I am not American and know very little about American history so I cannot comment regarding the lending role of England and America. In the Bible, Israel was not permitted to lend to its own people with interested, but it could lend to others. My opinion is that if lending is a service (determined by the rate and the conditions of the loan) it is not wrong for Christians to lend to each other. The beauty is that if someone disagrees they can lend to others at 0% and there is nothing wrong with that. Don’t forget the parable of the talents that Jesus told. The servant who hid his talent in the ground was rebuked by the master for not putting the money to the exchangers to earn usury. Nowhere in the telling of this story does Jesus condemn the practice of investing money for interest. He could have. That would have been a good place to teach that lesson, if he so desired. Matthew 25 is where this parable is found. Parables are hard to pin down so you can take too much from the content of the parable. For example, in Mathew 24:51 the master comes home and cuts a person to pieces. It would seem inappropriate to say that person represents God and God will cut people to pieces. Instead, the items in parables often represent something else in order to express a truth about the Kingdom of God. Do you have any idea where to get a loan for bad credit? I just need a second chance in life. I might have a bad credit but that doesn’t mean we are bad people. Hope you have answer to my question. I’m sorry, but I don’t know a place to get a loan for a person with bad credit. with my facebook fans and they loved the blog. Keep up the great posts.